In what ways is human cognition language-augmented cognition? Humans use language — a culturally transmitted open-ended compositional system of communication. We are interested in understanding what aspects of human cognition owe themselves to language–both learning a language, and its use moment-to-moment. Our work has examined how perception, categorization, memory, and reasoning are augmented by language. A framework for thinking about these effects is to think of words not as mapping onto pre-existing conceptual representations, but as cues that help construct these representations. On this view, words serve as “categorical priors” helping to create more categorical and compositional mental representations. Review and theory papers describing this work can be found here, here, here, and here. We are also trying to understand what precise information we learn from direct experience versus from the statistics of language. These ideas are described here and here. Several current projects in the lab involve large-scale comparisons of cross-linguistic word embeddings to discover the ways in which different languages convey similar versus distinct information at a statistical level. We are also actively investigating the role of ‘nameability’. Does it matter if some feature or relation happens to have a compact verbal form? (hint: yes it does!). On this view, what makes some categories difficult to learn and reason about is not that they are inherently difficult, but that they happen to not have compact verbal expressions. The implication is that it is possible to reason more effectively by learning new words and expressions. You can read some popular-media coverage of the lab’s work from the New York Times (do you talk to yourself? ), New Scientist, the NPR blog or listen to Gary Lupyan talking to Shane Mauss on the Here We Are podcast. Why are there different languages? Do languages adapt to the needs and biases of their learners and users? One of the most remarkable aspects of language is its diversity. Although all natural languages share certain design features, such as the use of discrete words and a compositional structure, languages vary enormously in their patterns of naming and in the grammatical devices they employ. What forces are responsible for creating these differences? Do languages diversify simply due to random drift, as has been long assumed? Or might there be some selection at work that drives languages apart in a way analogous to the forces that produce diversity in the biological realm? We have been investigating how languages are affected by social and demographic factors such as the number and diversity of language-users. We term the idea that languages adapt to biases of their users, the linguistic-niche hypothesis. This work is funded by an NSF INSPIRE award. You can read more about this work in the New Scientist, the Economist, read a recent chapter on this topic, or a review in Trends in Cognitive Sciences. Ongoing projects involve systematically comparing linguistic redundancy (compressibility) and determining whether the high redundancy of some languages has a functional role, namely helping young children learn the language. What are the seed-words of language? Early vocabulary has been a surprisingly good developmental predictor. Jointly with Haley Vlach, we are working on an NIH-funded project to understand the causal links between early language and later cognition. Part 1 of this project aims to identify which early-learned words promote the learning of more words. Part 2 aims to understand whether and how these words promote inductive inference in preschool-aged children. How do programming languages influence human cognition? Physical tools such as microscopes and telescopes have expanded the range of our senses and allowed for scientific discoveries that would be impossible without these tools. Far from being cloistered in scientific journals, the discoveries that these tools made possible have transformed what people think and do (skeptical? Think Germ Theory of Disease). In addition to such physical tools, modern science makes extensive use of computational tools ranging from programming languages to statistics packages and data-analytic environments. In what ways is scientific progress and human reasoning itself being transformed by these tools? We have recently begun a Sloan Foundation funded project to investigate this question using approaches that include large-scale data-gathering (e.g., analyzing GitHub repositories) and experimental (e.g., examining how source code evolves as it passes from one person to the next). To what extent is what we perceive affected by what we know and expect? We perceive as we do because our perceptual systems have been honed by evolution to transform energy into forms useful for guiding our actions. This process is flexible in that our current needs often determine what form of information is useful. Work in the lab examines how knowledge and expectations can act as priors changing how people perceive. Many of these investigations involve testing how language may augment (visual) perception. These studies take as inspiration Edward Sapir’s remark that “even comparatively simple acts of perception [may be] very much more at the mercy of the social patterns called words than we might suppose”. Our work on this topic can be found here. You can also popular press coverage of some of this work here and here, and read a in-depth review of how such top-down effects on perception arise when one views the brain in a predictive-coding framework. We are winding down this research direction in the lab. Why are some explanations especially satisfying? Why do different scientists prefer different theories to account for the same data? Some explanations seem very compelling, even if they are factually wrong. Other explanations seem completely unsatisfying, even if they are, technically speaking, correct. A new line of research is examining what makes some explanations more satisfying than others and why some people prefer some types of explanations. In a related project, we are examining whether certain cognitive biases predict whether a given scientist prefers one type of theory/explanatory framework over another. This work was part of the Templeton-funded Metaknowledge network. 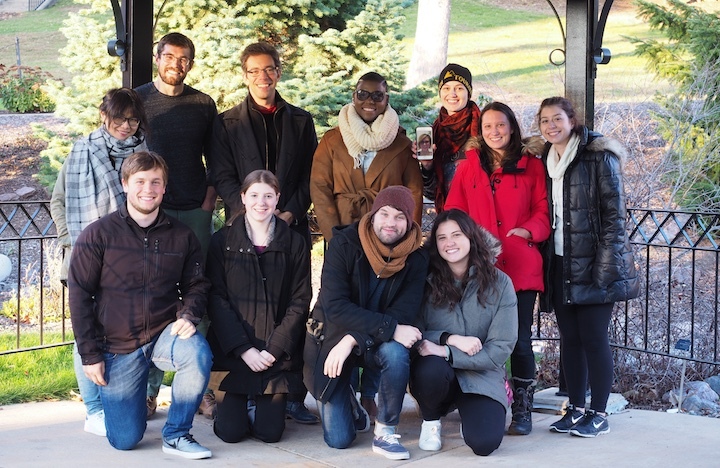 The lab is enthusiastically accepting graduate students for Fall, 2019. If you are interested, please get in touch. Applicants are advised to look through the lab’s recent publications. If you are an undergraduate at UW-Madison interested in getting involved as a research assistant, please complete this online application. We have a history of hosting scholars from various disciplines interested in the language-cognition links. If you are a graduate student/researcher interested in spending some time with us, get in touch! Can a game of vocal charades act out the origin of language? Gary Lupyan on Shane Mauss's Here We Are podcast. © 2019 Lupyan Lab	- Theme: Patus by FameThemes.